Svaneti, a high mountain region in northwestern Georgia, is an unusual and surreal land of towers, rocky terrain, and snow-covered peaks in the Greater Caucasus Mountains. This UNESCO World Heritage Site is one of the country’s remote areas recently renovated with tourist infrastructure. 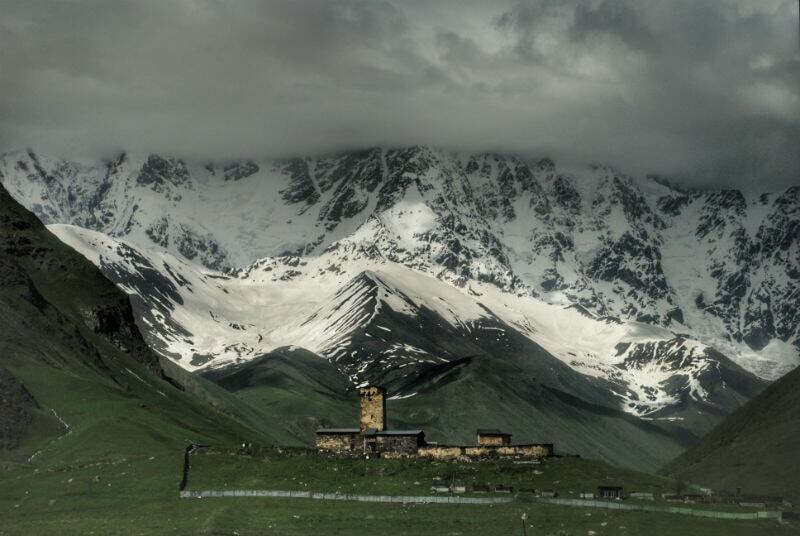 Now, every traveler who comes here to explore Georgia tries to get a glimpse of Svaneti for at least a short period. Here’s our guide to the best things to see and do here. Located 456 kilometers (283 miles) away from Tbilisi, at 1,500 meters (4,921 feet) above sea level, Mestia is the starting point for many trips throughout the region. From here, you can hike up to glaciers, learn about the Svan culture at the museum, try local delicacies, and ski at one of Georgia’s ski resorts. One of the most significant things to do here is to visit the Museum of History and Ethnography. You can also explore the house museum of the famous Georgian alpinist Mikheil Khergiani. There’s a well-marked trek from Mestia to Ushguli—the most remote area of the region, a UNESCO site, and the highest settlement in Europe. The tourist information office in Mestia has all the information you will need to pursue the hike. Each village along the route has a guesthouse, so accommodation options are plentiful. Once in Ushguli, you can visit the local ethnographic museum in the village of Chazhashi and see medieval repoussé metalwork, processional crosses, and icons, as well as learn how people lived in those defensive towers you see everywhere in the region. Lamaria Church offers spectacular views of the Shkhara mountain, and inside, it features old frescoes. Named after the Virgin Mary, the legend of the church is connected with the late 19th-century murder of a lord by the name of Puta Dadeshkeliani, who wanted to rule over the community. Puta was going to meet with two people in front of the church, but the whole community showed up to help pull a cord attached to the trigger of a rifle. Using this method, they divided the responsibility equally for killing the man who sought to rule over them; they had never had a ruler. If you are not up for a hike, there are minibuses, called marshrutka, that travel from town to town. However, it might even be more comfortable to hire a taxi. Locals are friendly and are used to tourists and mountain climbers who wander through their small villages. Some of the communities to put on your itinerary are Mazeri, Lendekhi, Soli, and Mele. The Becho community, situated in the valley of Dolora River west of Mestia, is a spectacular place and an area less visited by tourists. It’s also near the twin-peaked Ushba, Georgia’s mightiest and most dangerous mountaineering challenge. The highest village is Mazeri, which also serves as an excellent base from which to explore the area. You can walk towards the Dolora River, the glaciers on the west side of Ushba or to the communities of Etseri and Laleti. Additionally, you can visit the fortress of the princes of Dadeshkeliani and the famous Shikhra Valley. From here, you can take various trekking routes suitable for half- or full-day hikes. For instance, a trek to Shdugra leads to a significant waterfall, and Mount Mezir has a high viewpoint, mountain lake, and an ancient church. Guli Pass, on the other hand, is famous for panoramic views, breathtaking scenes of Ushba, and an old church. Tashmijabi, or Tash-M-Jab as locals call it, is a mashed potato dish enriched with cheese. And the more it stretches, the better it is. Kubdari is one of the most famous Svan meals. This meat pie is made from a mixture of pork and beef or only beef with onions and Svaneti salt.